There is no evidence to support that that music affects plant growth. However, playing choicest tunes may make gardening more fun and effective. With the intent to allow anyone develop a taste for gardening through good music, designer Qiangwei Flora Zhu has conceived the I-Flower I-MU concept speaker that further comes equipped with a conventional planter. 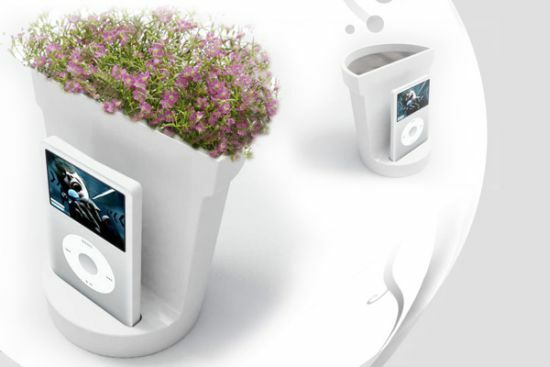 The flower-shaped speaker connects to your iPhone or iPod through a dedicated front pocket. A container houses the growing medium, i.e. soil, that rests on electrical components. Excess water seeps through its holey back, which further guarantees that your plant sustains its normal growth.